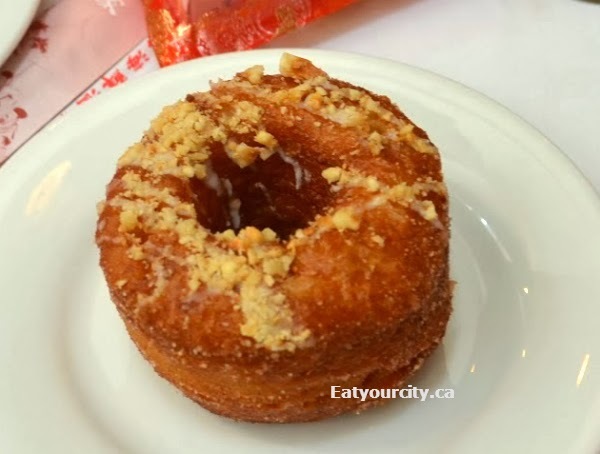 Eat Your City: Swiss Bakery, Vancouver BC - heavenly Frissants - first Canadian hybrid of a croissant and donut.. Canada's cronut! 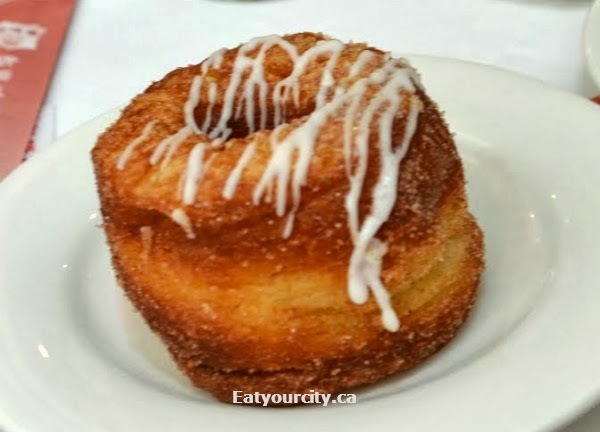 Swiss Bakery, Vancouver BC - heavenly Frissants - first Canadian hybrid of a croissant and donut.. Canada's cronut! 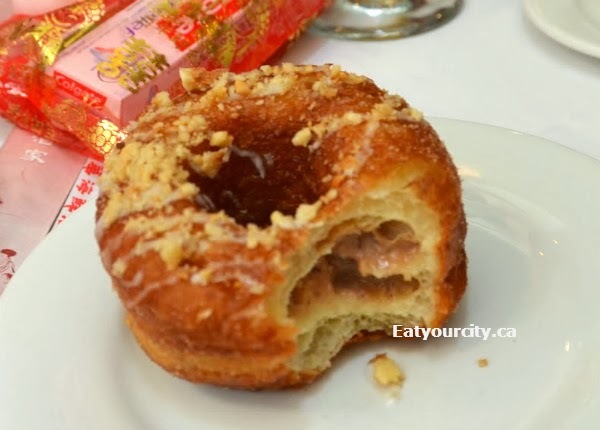 Posted by There's been a craze for south of the border in NYC for cronuts... the delectable hydrid of a croissant and donut. While I haven't yet had a chance to try the original cronuts at Manhattan's Dominique Ansel Bakery, but I was super excited to try the first Canadian version... sweet croissant dough is cut into donut shapes, deep fried to perfection, injected with fabulous rotating flavors of pastry cream and drizzled and/or topped with toppings. The Frissant takes 3 days to make, and is the ultimate in indulgence and if you don't find yourself in a food-gasm after biting into one, you're a zombie. Last summer, Swiss Bakery had line ups out the door of hopeful customers with their eye on scoring a limited number of Frissants, the ridiculously delicious pastry cream filled croissant-donut. They didn't care about what flavors they were selling that day... they just wanted them in their hands and swiftly.. into their tummies. Sadly, we only had a short week in Vancouver as we were attending a wedding, so we weren't able to join the line-ups to taste this decadent Frissant. Luckily (and I mean realllly luckily), the bride was able to get some for her wedding reception! I swear, I heard some angelic music playing in the background when I saw a whole tabletop full of Frissants!!! Here's the Vanilla Frissant. It took months and countless recipes before the powerhouse daughter and father team Annette and Michael Siu, master bakers at Swiss Bakery was able to come up with a recipe that results in this flawless, insanely addictive bite of happiness. Its like biting into an excellent sweet croissant with a crisp exterior... and then your mouth fills with cool smooth creamy vanilla flavored pastry cream that's present in every single nook, cranny and layer upon layer of light fluffy pastry. And lightly drizzled with a bit of vanilla icing. This must be what heaven tastes like on earth. The Hazelnut Frissant was also incredible and addictive. Again, the Frissant is incredibly light and not too sweet layers upon layers of light fluffy pasty is combined with a delectable rich hazelnut praline pastry cream... and topped off with toasted hazelnuts. Sooooo damn good! To the bride's amusement, my boyfriend inhaled two Frissants within the amount of time it took me to take one bite. 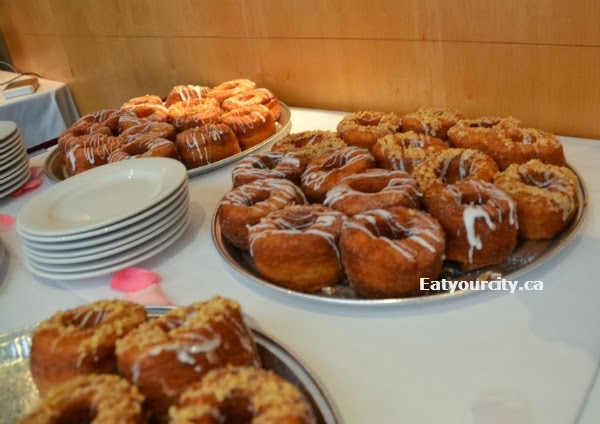 The wedding guests made these babies disappear like magic! And then the bride let us in on her secret of how she pulled off having a table full of Frissants. The super talented and lovely Annette Siu of Swiss Bakery... was her bridesmaid and as a wedding gift the Frissants and wedding cake were both provided by Swiss Bakery! Now only if I could recruit her to be a bridesmaid... but you can still get a taste of these amazing Frissants at Swiss Bakery! Call to pre-order to avoid the line-ups! Swiss Bakery's Frissants are a must try!